On a recent evening in New York, an army of waiters dressed in black buzz around tables of hundreds of young hipsters and older business-types. It's just the kind of crowd de Pury savors — a fundraiser for the New Museum in New York City. In his trademark, double-breasted suit, de Pury is known for bringing the rush of a sports event to the auction room. He's a theatrical, sophisticated salesman. As the bidding escalates, he points right, left, and center throughout the vast party room. He growls like a rock star when somebody ups the ante. At this particular auction de Pury appears to be calling on real people when they bid. That doesn't always happen, as he reveals in his new book. One of an auctioneer's tricks is the "chandelier bid." As de Pury explains it, the "auctioneer raises the ante by pointing to a vague rich someone in the back of the room. That someone could be a chandelier." He continues, "It's within the auctioneer's discretion to make up bids throughout a sale, just to keep a slow auction rolling, up to whatever confidential minimum reserve price has been agreed upon by the seller and the auction house." And, he writes, "it's all completely legal." Filmmaker Ian Denyer calls de Pury "a shaman and a swaggerer." Denyer followed de Pury around for about a year making a documentary about him for BBC4 TV called The Man with the Golden Gavel. "He exudes charm, so people are being charmed out of their cash," says Denyer. The dashing de Pury charms, not just in the auction room, but wherever the wealthy reside: mansions, yachts, swanky parties. It helps that he himself is an aristocrat, a Swiss Baron. In the town of Neuchatel, Place Pury is named for one of Simon's ancestors — there's even a statue of him. Denyer says de Pury is right at home with the rich and famous. "He is of the people that he works with and represents and sells things to and for," says Denyer. "He moves amongst them and therefore has sort of free access to them. We went to parties, in our film, and we had to leave them at the door because, as the media, we were simply too filthy to enter." De Pury grew up in Basel, Switzerland, an art-loving city and home to one of the biggest art fairs in the world. De Pury says he once wanted to be an artist himself. "And I rapidly had to come to the conclusion that I was not good enough to make a living out of it," he says, in his Swiss-English accent. "And that's when I felt the next best thing is to make a living out of the art of the artists who are good and who are very talented." After studying art and apprenticing with a dealer, he discovered the thrill of auctions. He's also the first to admit he's got the ego to run them. In his new book he writes that "whenever" he "saw a podium," he "wanted to be on it." De Pury spent several years working at Sotheby's, in London, Geneva and Monte Carlo. Life within the two big auction houses is all about convincing private collectors to sell through you and not the other house. De Pury thrived in this atmosphere. In the late 1990s, he and a partner did the unthinkable: They tried to take on the big two. "The big challenge was, in an industry dominated by a duopoly, to try and create a third force," says de Pury. The new auction house Phillips de Pury had a strategy. "I didn't have the means, the financial means, to take on the two houses frontally so we thought: Let's develop areas in which we become the best," de Pury explains. "So we thought we're going to do contemporary art, emerging contemporary art particularly, design and photography and in these fields we'll just become the best." Among the artists de Pury's new company sold were photographers Helmut Newton and Annie Leibovitz and edgy artists like Jean-Michel Basquiat and Cindy Sherman. The auction house also had its share of disasters. In his book, de Pury partly blames the financial turmoil that followed Sept. 11. One auction, at the height of the banking crisis in 2008, was described as a "humiliation." There was speculation de Pury's house would crumble. Sotheby's and Christie's have also had disastrous auctions. But a boutique house like de Pury's couldn't withstand them, says Nate Freeman, a senior writer with ARTNews. "It will always be Sotheby's and Christie's," says Freeman. "They are just so cut-throat against each other that it's very hard for a third house to break into that fierce rivalry between the two of them. And I think, at a certain point, Simon realized that." In 2012, the Russian company that was backing Phillips de Pury bought out all of Simon's shares, and he left the company. But he didn't give up the gavel. He tours the world auctioneering top-dollar charity events. Along with his wife, Michaela de Pury, who is also an auctioneer and collector, he started an online auction house. Simon de Pury also hosted Work of Art, a reality TV show on Bravo that pitted young artists against each other. De Pury has critics, but nobody disputes his knowledge and love of art. "The one reason I chose this profession is I'm simply obsessed with art," de Pury declares. "I love looking at great art on a daily basis and so doing this profession does allow me to see really great art every single day, and that is the beauty of it." The de Purys are avid collectors — in his memoir de Pury says that, when possible, he buys two to three new pieces a month for his private collection. He writes that through the "business of art," he gets to be "an artist in a dealer's suit." You've probably seen the crazy amounts of money spent at high-end art auctions - $81 million for a Mark Rothko, $179 million for a Picasso. Well, now comes a new memoir by an art world insider called "The Auctioneer." Simon de Pury is a charismatic figure known as the Mick Jagger of auctions. As NPR's Elizabeth Blair reports, he once tried to compete with the two powerhouses, Christie's and Sotheby's. ELIZABETH BLAIR, BYLINE: An army of waiters dressed in black buzz around tables of young hipsters and older business types. It's just the kind of crowd Simon de Pury savors, a fundraiser for the New Museum in New York City. 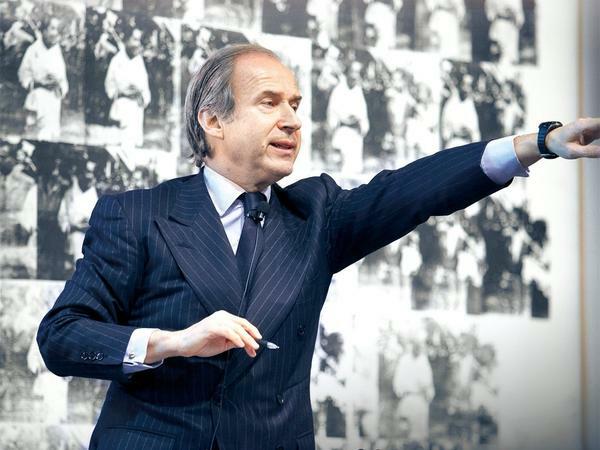 SIMON DE PURY: $95,000. It's a (unintelligible) you, sir. Yes, $100,000. We have $100,000. BLAIR: In his trademark double-breasted suit, Simon de Pury is a theatrical, sophisticated salesman. DE PURY: A shaman and a swaggerer. BLAIR: Ian Denyer followed de Pury around for a year making a documentary for BBC for TV. IAN DENYER: He exudes charm, so people have been charmed out of their cash. BLAIR: And not just in the auction room. To charm wealthy collectors, de Pury travels the globe visiting mansions and yachts and swanky parties. It helps that he himself is an aristocrat, a Swiss baron. DENYER: He is of the people that he works with and represents and sells things to and for. He moves amongst them and therefore has sort of free access to them. We went to parties in our film, and we had to leave him at the door because as the media, we were simply too filthy to enter. BLAIR: De Pury grew up in Basel, Switzerland, an art-loving city and home to one of the biggest art fairs in the world. He once wanted to be an artist himself. DE PURY: And I aptly had to come to the conclusion that I was not good enough to, you know, make a living out of it. And that's when I felt the next best thing is to make a living out of the art of artists who are good and who are very talented. BLAIR: After studying art and apprenticing with a dealer, he discovered the excitement of auctions. And he's the first to admit he's got the ego to run them. In his new book, he writes that whenever he saw a podium, he wanted to be on it. BLAIR: De Pury brings the rush of a sports event to the auction room. He spent several years working at Sotheby's in London, Geneva and Monte Carlo. Life at one of the two big auction houses - Sotheby's or Christie's - is all about convincing private collectors to sell through you and not the other house. De Pury thrived so much so that in the late '90s, he and a partner did the unthinkable. They tried to take on the big two. DE PURY: The big challenge was in an industry dominated by a duopoly - to try and create a third force. BLAIR: The new auction house Phillips de Pury had a strategy. DE PURY: I didn't have the means, the financial means to take on the two houses frontally. So we thought, let's develop areas in which we become the best. So we thought we go to do contemporary art, emerging contemporary particularly, design and photography. And in these fields, we just become the best. BLAIR: De Pury's new company sold works by edgy artists like Jean-Michel Basquiat and Cindy Sherman. The auction house also had its share of disasters. In his book, de Pury partly blames the financial turmoil that followed 9/11. One journalist called an auction in 2008 a humiliation. The scene was captured by Ian Denyer's film for BBC for TV. DENYER: The room fails to take the baron's bait, and he's forced to hiss his least favorite word. DENYER: The word past means the work has not sold. BLAIR: There was speculation de Pury's house would crumble. Sotheby's and Christie's have also had disastrous auctions. But a boutique house like de Pury's couldn't withstand them, says Nate Freeman, a senior writer with Art News. NATE FREEMAN: It will always be Sotheby's and Christie's. They are just so cutthroat against each other that it's very hard for a third house to break in to that very, very fierce rivalry between the two of them. And I think at a certain point, Simon realized that. BLAIR: In 2012, the Russian company that was backing Phillips de Pury bought out all of Simon's shares, and he left the company. But he didn't give up the gavel. He tours the world auctioneering top-dollar charity events. He started an online auction house and hosted a reality TV show that pitted young artists against each other. DE PURY: Each of you has his own dedicated section of the gallery to store your work. BLAIR: Simon de Pury has critics, but nobody disputes his knowledge and love of art. DE PURY: One reason why I chose this profession is that I'm simply obsessed with art. I love looking at great art on a daily basis and so doing this profession does allow me to see really great art every single day. And that is the beauty of it. BLAIR: He writes in his book that through the business of art, he gets to be an artist in a dealer's suit. Elizabeth Blair, NPR News. Transcript provided by NPR, Copyright NPR.